I recently purchased a PS3 for the family. My intention is to get the family gaming in the livingroom again, especially Olly who used to be an avid gamer. I obtained a list of games from my friend SDA at work, games that met rather specific criteria: family friendly (i.e. no excessive violence), 2D for Olly, reasonably easy & intuitive gameplay, and an awesome soundtrack. Top of his list came Portal 2, which i have yet to explore. Next on his list came "Journey". I picked up Journey while at my local Public Library and began playing it last Thursday. I was, quite simply, overcome at how awesome the game was .. I was stunned! 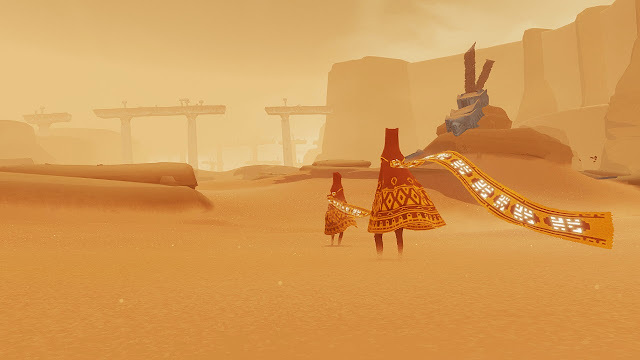 Journey looks fantastic, as you can see by the stills included in this post ... thatgamecompany went all out to make an expressive work of art. The developers sought to evoke in the player a sense of smallness and wonder, and i think they achieved their goal. All i could think about was the Cyclopean architecture of HPLovecraft’s "at the mountains of madness" ... the space is both big and otherworldly, and is both unsettling & deeply engaging too. 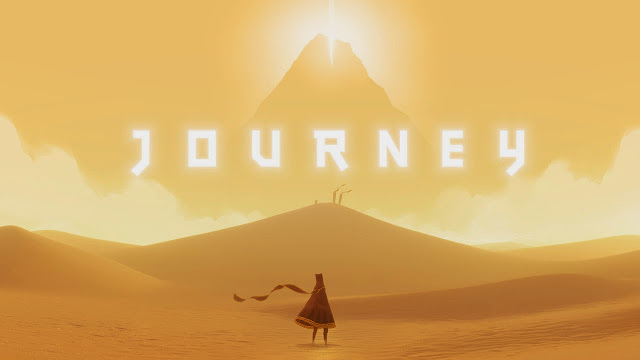 Journey sounds fantastic too, as you can hear from the embedded player at the bottom of this post ... the soundtrack was composed by Austin Wintory and features Amy Tatum (flute/bass flute), Charissa Barger (harp), Rodney Wirtz (viola), Noah Gladstone (serpent), Sara Andon (flute), Lisbeth Scott (vocals), Oleg Kontradenko and the Macedonia Radio Symphonic Orchestra, and at the heart of it all, cellist Tina Guo. "I often say that my music isn’t music until a musician has gotten their hands on it but never was that more true than with this score." Such truth in these words. 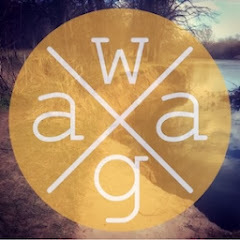 Their work is first class, pure & simple. It makes the game all the more magical & engaging whilst working well on its own. It is on a par with the soundtrack to "Crouching Tiger, Hidden Dragon" with Guo playing the part of Yo Yo Ma. If you have a fondness for the cello or music with a particular mystical Eastern ambience then this is once album you need to own. The game itself is rather straightforward to play. It doesn’t contain any violence or spoken dialogue. There is mild threat in places but that’s is easily overcome by staying out of the way of the big beasties. 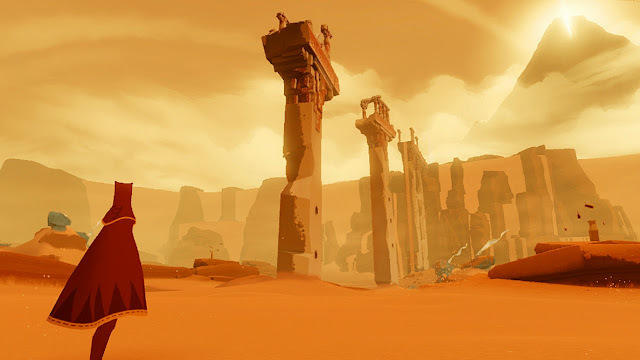 You can play with another player too but not in the conventional manner that we’ve become accustomed to: in Journey, a character appears & journeys with you. You can’t interact with them & only find out who they are when the end credits role. 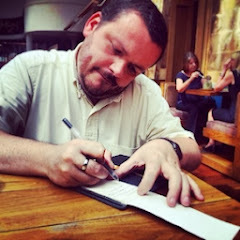 This interaction is included to teach collaboration & working together, and is a really nice touch. I really enjoyed playing the game & whilst i completed it in a couple of hours, it is worth the investment in both time & money. Someone referred to it as a pilgrimage & i cannot think of a better phrase to use. 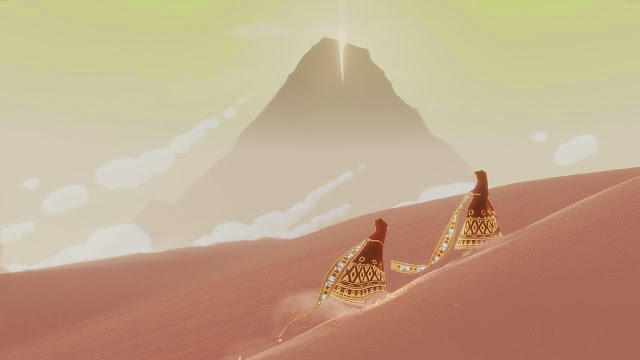 Journey is a beautiful, wonderful experience; one i would highly recommend.